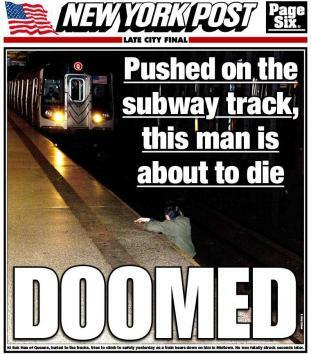 I finally looked at the NY Post front page headline, Doomed, the man on the tracks, yesterday. I’ve been a journalist for 25 years, wrestled with all kind of ethical issues. I know NY Post people, I worked alongside Post city editor Michelle Gotthelf for 2 years at APBNews, invited her to a Livingston Award ceremony I won for a piece she helped edit- cool woman. I sat next to the Post’s main rewrite guy Todd Venezia for two years at another newsroom. I worked in the Bronx courthouse with Post reporter Douglas Montero, a decent guy. But that front page — a daughter and a mother had to see that photo. Are you out of your fucken minds. What no shame because there’s no name for the headline writer and the person who put it on the front page? No apology? This headline made me so upset, I was screaming at the screen for 15 minutes. I’m not a reckless, immature, protestor — but I seriously, seriously was considering throwing a brick through your window or doing something civilly disobedient. And I probably will — gladly do a small sentence and have a record for something like that. I’ve bought 3 papers a day for 25 years. I won’t buy the Post anymore. I won’t ever talk to a Post employee again. I had a wife who died, if you posted a picture of her like that before she died, I would be in your office acting like a common criminal, a thug, doing as much destruction as possible to your office. You have power with your paper — you abused that power terribly. The man or woman who made that decision to do that front page — name your goddamn self, be a man, meet with the dead man’s 20 year old daughter Ashley, look that kid in the eye and explain your actions. At least have that courage, that decency — make it right. You really hurt so many people — can you really not care so much? I taught journalism in a juvenile prison, I used the NY Post sometimes to teach my students — I would never again. I’m so sickened. Please do something to make this right. It really matters to a lot of people. And people will remember this photo and this headline for a very long time.